The teen author behind the Pendragon series visits with the final novel in his #1 bestselling SYLO Chronicles trilogy. In SYLO, fourteen-year-old Tucker Pierce and his friends escaped Pemberwick Island and the mysterious SYLO agency. In Storm, they navigated a United States at war with itself and survived betrayal from within. Now in Strike, Tucker and his friends remain on the run. They are driven directly into the base of the invaders, where they discover a strange set of glowing doors. Once they walk through them, they will never be the same. ABOUT THE AUTHOR D.J. MacHale is the author of the bestselling book series Pendragon, the spooky Morpheus Road trilogy, and the whimsical picture book The Monster Princess. He has written, directed, and produced numerous award-winning television series and movies for young people including Are You Afraid of the Dark?, Flight 29 Down, and Tower of Terror. He lives with his family in Southern California. You can visit him online at djmachalebooks.com. Please join us when #1 New York Times bestselling author D.J. MacHale (PENDRAGON), comes to present and sign STORM, Book 2 of his action-fueled, tantalizingly plotted SYLO CHRONICLES sci-fi conspiracy trilogy. D.J. MacHale is the author of the bestselling book series Pendragon: Journal of an Adventure through Time and Space, the spooky Morpheus Road trilogy, and the whimsical picture book The Monster Princess. 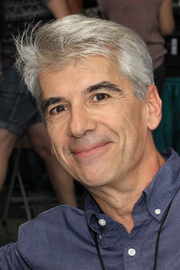 He has written, directed, and produced numerous award-winning television series and movies for young people including Are You Afraid of the Dark?, Flight 29 Down, and Tower of Terror. D.J. lives with his family in Southern California. You can visit him online at djmachalebooks.com. D.J. MacHale is the author of the bestselling book series Pendragon: Journal of an Adventure through Time and Space, the spooky Morpheus Road trilogy, and the whimsical picture book The Monster Princess. He has written, directed, and produced numerous award-winning television series and movies for young people including Are You Afraid of the Dark?, Flight 29 Down, and Tower of Terror. D.J. lives with his family in Southern California. Talk & Booksigning with D.J. MacHale for his new book, Storm! About the book: After a harrowing escape from the SYLO occupied Pemberwick Island, Tucker Pierce and his surviving friends have finnaly reached the mainland, only to find that no one is left. The once bustling seaport city is deserted. From the bowels of a Portland hospital where they encounter their first fellow survivor, to the abandoned stores they must raid for supplies, Tucker, Tori and company set off on a quest for answers and, for Tucker, vengeance. Tucker soon realizes that "trust no one" doesn't just mean the U.S. military. D.J. MacHale is a writer, director, executive producer and creator of several popular television series and movies. His ten-volume book series Pendragon became a New York Times #1 bestseller. As co-creator of the popular Nickelodeon series, Are You Afraid of the Dark?, he produced all 91 episodes over eight years. D. J. MacHale's book SYLO was available from LibraryThing Early Reviewers. D. J. MacHale is currently considered a "single author." If one or more works are by a distinct, homonymous authors, go ahead and split the author. D. J. MacHale is composed of 6 names. You can examine and separate out names.